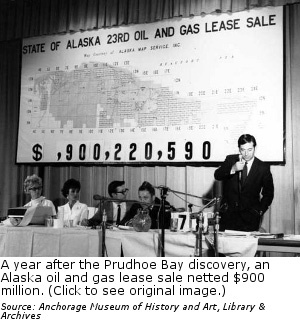 In 1969, the state received about $900 million from the North Slope oil lease sale. Lawmakers moved to address a large backlog of unmet needs, increasing demands, and the prospect of rapid population growth. The 6th Legislature paid particular attention to education, enacting the school debt retirement program to provide reimbursement to school districts for school construction debt, and amending the school foundation formula to better address equity in allocation of funds across districts. In 1970, lawmakers created the State-Operated Schools System, an independent agency, to provide for public education in the unorganized borough. State revenue sharing program to help ease fiscal problems facing local governments and to encourage local governments to provide public services. Kachemak Bay and Denali State Parks, and established a statewide system of wilderness trails and campgrounds. In 1970, lawmakers repealed the disaster oil and gas production tax and changed the oil production tax to a graduated system based on barrels per day per well with tax ratios ranging from 3 to 8 percent. The Legislature also adopted resolutions for ballot measures to eliminate the requirement to read or speak English as a prerequisite to voting and to lower the minimum voting age to 18 years. Kenai begins exporting liquefied natural gas to Japan. Oil is discovered at the second largest field on the North Slope at Kuparak. Governor Walter Hickel resigns and becomes Secretary of the Interior. Governor Hickel loses his job in late 1970 over his criticism of President Nixon's handling of student protests after the National Guard shootings at Kent State University and the U.S. invasion of Cambodia. Neil Armstrong becomes the first person to walk on the moon. President Nixon establishes the Environmental Protection Agency.